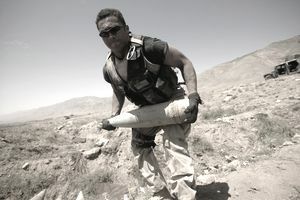 An Explosive Ordnance Disposal (EOD) Technician performs, supervises and manages explosive ordnance disposal (EOD) operations. Locates, identifies, disarms, neutralizes, recovers, and disposes of hazardous explosives; conventional, chemical, biological, incendiary, and nuclear ordnance; and criminal or terrorist devices. Related DoD Occupational Subgroup: 431. Conducts and supervises render safe operations. Responds to emergencies with equipment and technical data. Conducts long range and close in reconnaissance, identifies and assesses ordnance condition, and advises commanders on recommended safe withdrawal distances. Excavates and safes unexploded ordnance. Exploits unknown items for technical intelligence value. Uses monitoring and detecting equipment when ordnance may contain or may be contaminated with, toxic or radioactive materials. Disposes of unserviceable, excess, or dangerous ordnance. Transports demolition explosives and equipment to authorized disposal areas. Fabricates explosive demolition charges, and disposes of hazardous explosives. Neutralizes and disposes of improvised explosive devices and Weapons of Mass Destruction. Uses x-ray equipment, robotics systems, and remotely initiated or controlled tools and techniques to interrogate and gain access to the device. Wears special personal protective equipment. Serves as a member of base emergency response team. Provides ability to detect, monitor, evaluate, and decontaminate explosive, radioactive, chemical, or biological ordnance hazards. Identifies, safes removes and disposes of ordnance from crashed aircraft or vehicles carrying explosives. Recovers airfields denied by ordnance. Clears unexploded ordnance and hazards from airfields, forward operating locations, landing zones, and drop zones. Clears explosive contaminated property. Surveys extent of explosive contamination on AF property, and on bombing and gunnery, research and development, and munitions test ranges. Prepares clearance plans and cost estimates for clearance operations. Establishes operates and maintains EOD explosive proficiency ranges. Identifies requirements for and maintains tools, equipment, supplies, and technical data. Orders, inventories, stores, mobilizes, and maintains specialized tools, equipment, supplies, and EOD publications. Uses computers to support flight activities. Develops notional concepts, mission need statements, and operational requirements documents. Plans EOD contingency operations. Develops operation plans, concepts of operation, and operating instructions on EOD employment. Develops explosive safety plans. Supports special activities and taskings. Supports United States Secret Service, and other Federal agencies by providing protection to the President, Vice President, and other dignitaries. Deploys to support special operations and military operations other than war. Supports research and development testing of weapons, aircraft, and space systems. Supports specialized Joint Service task force operations. Provides EOD services to Federal, state, and local civil authorities. Instructs base and community members on ordnance recognition and protective measures for improvised explosive devices and conventional ordnance. Provides hazardous materials (HAZMAT) response capability for incidents involving explosive ordnance. Knowledge: This specialty requires knowledge of composition and characteristics of United States and foreign conventional, chemical, biological, improvised, and nuclear ordnance; basic electronics; precautions, tools, and protective equipment required for response to release of hazardous substances as operations level first responders and level three technicians; and proper handling, use, rendering safe, and treatment of hazardous explosive wastes. Education: For entry into this specialty, completion of high school or general educational development equivalency is mandatory. Courses in physics, mechanics, and basic electronic theory are desirable. 3E831. Completion of the explosive ordnance disposal apprentice course. 3E871. Completion of the explosive ordnance disposal craftsman course. 3E851. Qualification in and possession of AFSC 3E831. Also, experience rendering safe munitions, removing and treating hazardous unexploded ordnance, or decontaminating activities. 3E871. Qualification in and possession of AFSC 3E851. Also, experience performing or supervising rendering safe munitions, treating hazardous unexploded ordnance, or decontaminating activities. 3E891. Qualification in and possession of AFSC 3E871. Also, experience managing EOD functions or operations. For entry into this specialty, normal color vision as defined in AFI 48-123, Medical Examination, and Standards. For award and retention of AFSCs 3E831/51/71/91/00, eligibility for a Secret security clearance, according to AFI 31-501, Personnel Security Program Management. Required Appitude Score : G-60 and M-55 (Changed to G-64 and M-60, effective 1 Jul 04).